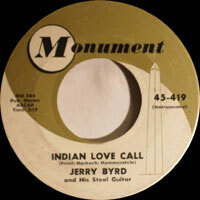 Steel guitariste Country US né Jerry Lester Byrd, le 9 Mars 1920 à Lima (Ohio). 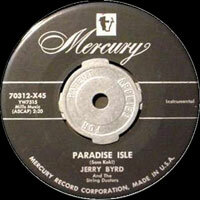 Jerry Byrd est décédé le 11 Avril 2005 à Honolulu (Hawaii). 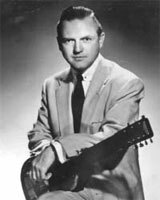 Famed guitarist Jerry Byrd was born on March 9, 1920 in Lima, OH. As a child, he developed a passion for Hawaiian music, although he made his first inroads into performing by playing country on an area radio station between 1935 and 1937. After a stint on Cincinnati's WLW, he joined the Renfro Valley Barn Dance in 1941; a year later, he jumped to WJR in Detroit, and remained there until he signed on with Ernie Lee's Pleasant Valley Boys in 1944. 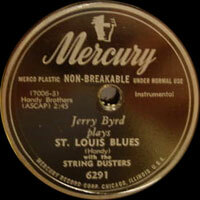 Byrd remained with Lee until 1946, when he formed his own group, the Jay-Bird Trio. Two years later, he joined Red Foley's band and became a session staple at King Records. 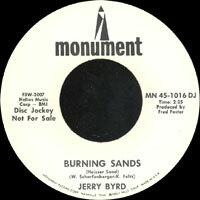 Also in 1948, Byrd cut his first singles, "Mountain Mambo" and, under the name Jerry Robin, "Sun Shadows." Later in the year, he issued his first 78, "Steelin' the Blues." 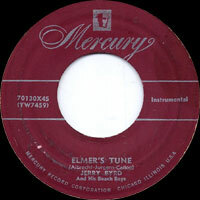 While at King, Byrd also recorded a handful of Hawaiian songs, and as the years wore on, the music became his primary focus. Still, Byrd remained an active figure on the country landscape; in 1950 he became a regular on Foley's NBC television program, and from 1954 to 1956 he was featured on the Nashville-based series Home Folks. An eight-year stint on the program Country Junction followed, and in 1964 he became a member of Bobby Lord's TV band. 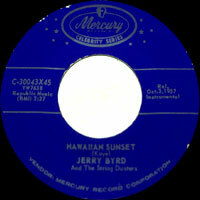 In 1968, Byrd left country for good, moving to Hawaii to focus exclusively on the state's native music.